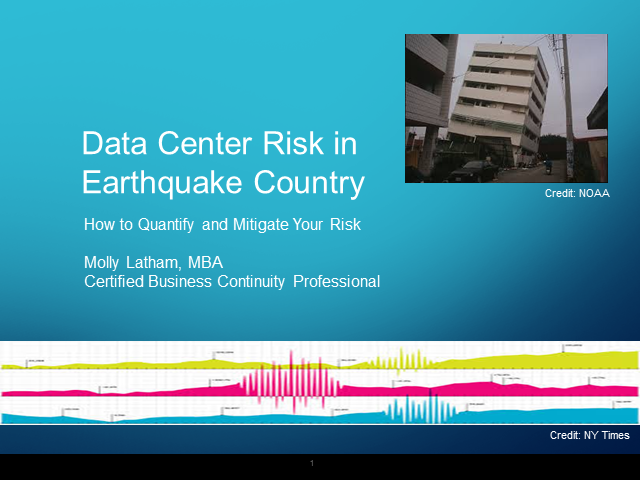 Companies operating data center in areas prone to earthquakes need to take a systematic approach to quantifying and mitigating their risk. For several years, Molly managed disaster recovery planning for a large Southern California utility. During her tenure, she commissioned two "seismic audits" of three data centers located in the region. Through these studies, she was able to inform management about the level and probability of the risk of losing the use of all three locations following an earthquake. This presentation will describe the techniques used and the benefits the study brought.